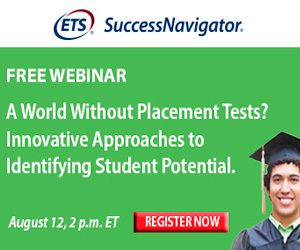 A world without placement tests? Home > A world without placement tests? Many institutions are not satisfied with the information given by course placement exams. In fact, some colleges and universities are considering how to place students without external, mandatory placement tests. While a great deal of research has supported alternative approaches to placement — as well as developmental education as a whole — there are still many questions for institutions looking to make changes. In this free webinar, three leading researchers and practitioners each answer the question: “How might we build a new system of course placement?” Speakers address issues such as holistic assessment, the use of multiple measures, course acceleration, and self-placement. View the video below, or use the link below to download the video file. Download the slide deck by clicking here .